Pizza! Who doesn’t love pizza?! It’s the perfect food for nearly any occasion and that’s why it’s a beloved choice of so many diners eating in, carrying out or ordering delivery. With right recipe, for pizza and profits, you can open up your own pizza place and grab your own slice of this popular, and still-growing in popularity, food choice. Make good pizza. Seems fairly obvious, right? No matter how good everything else is, if the product doesn’t stack up your customers won’t last long. The first and most important thing you need when starting a pizza business is good pizza. 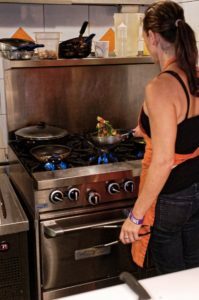 A lot of people who go into the restaurant business have already tinkered around in their home kitchens or have an old family recipe that has been passed down for generations. For those who do not have such a solid foundation, there are several basic pizza types that you can choose to offer. Decide between franchising and going independent. More than half of all pizzerias in the United States are independently owned or small chains. Staying independent means that you have complete control over your business and your brand, which some people prefer. However, franchises already have brand awareness and have already solved some of the problems that new restaurant owners run into. Overestimate your startup costs. A lot of new restaurant owners underestimate how much it costs to open a restaurant. In order to plan for unforeseen expenses, adding an additional 15% to 25% to your budget will help you get through the crucial first year. Offer delivery and/or carryout. The fact of the matter is, a lot of people enjoy the convenience of being able to place a phone call and have a hot pizza delivered to their door in under an hour. 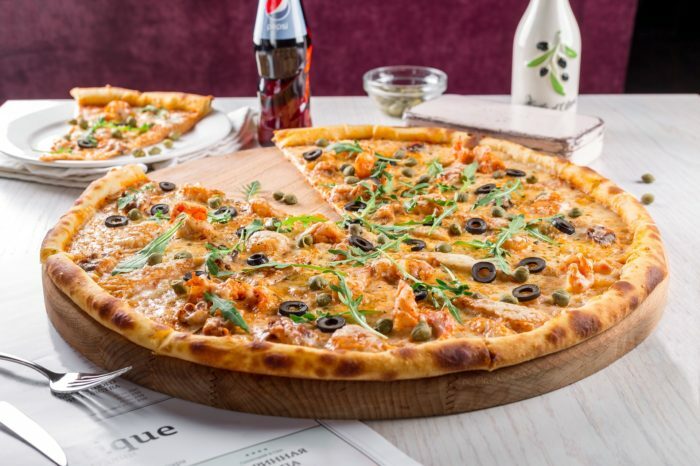 With over 1 billion pizzas being delivered each year in the United States, having some sort of pizza delivery or carryout option will assure that you are not turning away customers that want to eat at home but do not want to cook anything themselves. Offer more than just pizza. Very few restaurants survive by offering a limited menu. 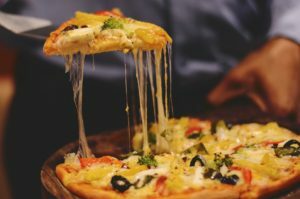 Many pizza shops offer calzones, pasta or other Italian favorites to cater to individuals who are in the mood for tomato sauce and comfort food, but not necessarily pizza. Lock in commodity prices. Cheese and flour are the most heavily used ingredients in the pizza industry. Unfortunately, the prices for these basic ingredients can fluctuate greatly on a daily basis, which can affect your bottom line. To better control your costs, you can contract with a food supplier to lock in a price for cheese, flour or other commodities so your prices are not subject to the whims of the stock market. Control your portions. Portion control is crucial to controlling overall ingredient costs, reducing waste and providing a uniform product. Use food scales to measure dough ingredients, flat bottom ladles for saucing a pizza and measuring cups for your other toppings to ensure that you are not losing money by putting too many mushrooms on a pizza. Cater to the masses. If you provide delivery at your pizzeria, then catering should be easy to implement. Schools, offices or any event that needs to feed a lot of people can easily be catered by a pizza shop. For most parties, you can expect to serve two or three slices of pizza per person. You will also want to include some of your other menu items on the catering menu, at a discounted price. Insure your delivery driver. Restaurants are required to carry insurance against loss of their business, worker’s compensation and basic liability insurance. Establishments that provide delivery services will need to carry additional liability insurance to cover their drivers when they are on the clock. Be wary of discounting. Pizzeria customers are accustomed to the coupons that come on their pizza box. Coupons and discounts are a good way to bring customers in the door, especially during difficult economic times, but those discounts will eat into your bottom line. Also, if you discount too much for too long, it can erode your brand value. If you feel the need to discount, only do it for a limited time to protect your brand and your bottom line. Starting any new business can be a daunting task. New restaurants in particular face a steep uphill battle, because the majority of the concepts fail within the first three years. Luckily, you have chosen to provide food that 94% of the U.S. population enjoys eating, so as long as you educate yourself on starting a restaurant, you stand a fair chance of succeeding where man others have failed. 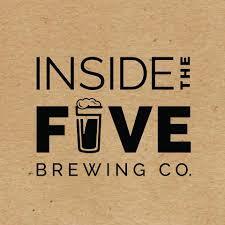 More Accolades for Inside the Five Brewing Co.
Fresh off their victory as the People’s Choice Award winner (and Judges’ Choice runner up!) at the Burger Bash earlier this month, Burkett customer Inside the Five Brewing Company earned a 4-star review in today’s edition of The (Toledo) Blade. The restaurant is in its first year and is owned by Chris Morris and Brandon Fields, two former NFL players who met during their time playing at Michigan State. Hence the clever name. Chris also went to high school with Burkett Business Development Manager Travis Lusky, which helped make Burkett his equipment dealer of choice. Read the full review by The Blade here and learn more about Inside the Five history and offerings by checking out their website here. Commercial ranges are staple pieces of equipment in many commercial restaurants. Before operating any commercial range, be familiar with all safety precautions located in the manufacturer’s operating manual. Below are our top ten suggestions for burn prevention, fire safety, and general equipment safety. 10. Keep the range clean. Residual grease and food particles may catch fire and quickly get out of control. 9. Be aware of hot surfaces. Take care when cooking and avoid burns from hot surfaces or flames. 8. Keep protective equipment handy. Keep pot holders and oven mitts handy. These are perfect for handling hot containers, pots, pans, and generally following safety precautions. 7. Never leave a hot range unattended. It is important to monitor and be in control of the heat and the product being heated at all times while operating the equipment. 6. Be careful of equipment tipping over. Ranges with light-gauge steel are often lighter and may tip easily, causing injury. 5. Never store items on top of a range. Even if the range is off, never cover or clutter the range top. This creates a fire hazard. 4. Keep flammable items away. Flammable liquids or chemicals should not be stored on or near surface of the range nor on the floors surrounding the range. 3. Keep the floors clean. Be sure to clean up any grease or water spills on the floor near the range. This eliminates the possibility of slipping and falling onto hot surfaces. Know how to care for the commercial range. Replace the range when the overall structure is compromised due to warping, broken components or potential gas leak. 1. Be aware of gas leakage. The flame emitting from a burner ought to be steady, quiet, and blue in color. A sputtering yellow flame may be problematic and require a certified technician’s help. Everyone knows what it’s like to go into a restaurant and have a bad experience. You have to wait 20 minutes before placing your drink order. You have to ask twice for a glass of water and on top of it all you were treated rudely. But aside from these obvious mistakes and oversights, what can a successful server do to rise above mediocrity and provide a great restaurant experience for the guests? Know the menu. When a customer asks you a question, they want a concise and instantaneous answer. To do this, you need to do your homework. Taste all of the dishes and beverages on the menu and if allergy or other dietary restrictions prevent you from doing this, ask a coworker for information and take notes. Always be able to provide menu information when it is requested. Customers expect you to know more about the menu than they do, and appreciate a bit of guiding to make the choice for their preferences. Know how to pace a meal. You can’t control every aspect of a meal’s pace, after all if the kitchen hasn’t finished making it you can’t deliver it. 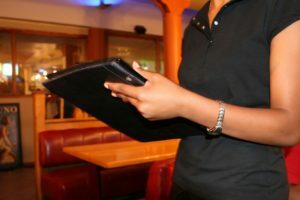 However, you can ensure that guests get their drinks in a timely manner and that they don’t receive their entrée right on top of their appetizers. Resist clearing plates before everyone has finished, many patrons feel rushed when this happens. The customer should not be aware of how you set the pace, and if done properly they will leave feeling contented and relaxed by the end of the meal. Be attentive, but not intrusive. A server must know how to strike the right balance when attending to a table’s needs. Customers feel uncomfortable when they have to chase a server down for any reason, and they feel equally awkward when lingering servers hover around tables with water pitchers. Use your eyes and ears to notice when a customer needs something, but otherwise let your customers have their space. Be perceptive. If you’re going to be a good server, you must have a knack for reading people. Some groups will appreciate a few jokes and a little chit-chat; others will want you to make yourself as invisible as possible. Some will want everything to move quickly; others would prefer not to feel rushed. Look for body language and listen for verbal cues and cater to each customer’s preferred dining style. Be adaptable. In addition to being able to adapt to the different personalities of your guests, you will need to adapt to situations as they arise. Although a server cannot control everything that happens in the restaurant, a smart server knows that quick thinking makes up for most unforeseen problems. Did the kitchen forget to leave out the onions from a guest’s salad? Offer a free drink or appetizer while they wait for the replacement to arrive. This will ensure the guest is still happy when it comes time to pay the bill. Keep your cool. Sometimes the kitchen makes mistakes. When this happens, a successful server should be able to keep a calm and collected demeanor throughout the ordeal. The key is to not allow the issue to affect the service of an entire section. You can’t win them all, but when things go wrong it is essential to not let them grow worse. Be courteous. Seems obvious, right? But what about if a customer is already upset when you approach the table for the first time? The quickest and truest remedy to this is using a few friendly words. For example, on an extremely busy night customers are likely to arrive at their table overly hungry, out of patience and looking for fast gratification. Approach the table with a smile and acknowledge their disparagement with a simple “I’m sorry about the wait” and move on to collecting drink and appetizer orders. Above all, customers want to feel that you actually care about their dining experience. Keep hospitality in the forefront of your actions and aim to create an exceptional experience for each and every guest. 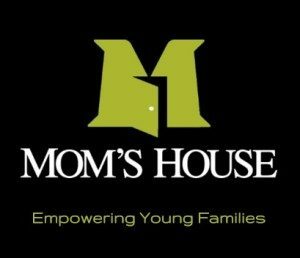 Mom’s House, a non-profit childcare center in Toledo, OH that helps low-income, single moms graduate from high school, technical school and college, was recently burglarized and suffered more than $10,000 worth of damages. Among the items stolen were appliances in the organization’s kitchen. When Burkett Account Executive Nathan Beucler heard about the news, he said he knew he had to do something. Sesco Food Service Equipment immediately responded to Nathan’s request and agreed to help donate a Panasonic 1054F commercial grade microwave. “We are happy to help out an organization in their time of need, especially one like Mom’s House that means so much to their community,” said Ken Barr, territory manager at Sesco. Although damages and losses totaled more than $10,000, Mom’s House Executive Director Christina Rodriguez said insurance claims only covered about 30-40% of the cost for the commercial kitchen appliances due to their age. Burkett annually gives away more than $10,000 in monies, goods, and services to charities around the region. Rodriguez said she was impressed by the donation and even more so by Beucler personally delivering and installing the microwave at Mom’s House. Whether it’s a stand, a truck, or a pop-up shop, the street food business is rolling. Whether as a side hobby or a full time job, there’s no reason you can’t get in on the action. And it can all be done in three easy steps. Yes, really! Financing: Though a food truck business will be significantly easier to finance than a brick-and-mortar establishment, you will still need to invest a good chunk of change into your food truck. Consider what kind of equipment you’ll need, and whether you’ll be able to make everything on-site or if you will need use of a kitchen. A great option for cash-strapped entrepreneurs is to rent or buy a used truck. Vending license: Most cities require that you obtain a vending or business license in order to start your business. There are some rare exceptions, such as in Florida where you do not need a license to sell pre-packaged food. Zoning permit: A zoning permit may be necessary depending on your location and how long you plan to be parked. If you plan to park with a group of trucks, sometimes a special zoning permit is needed for this as well. Health inspection: You will need to have your truck inspected by the health department to ensure that you are in compliance with local health laws. 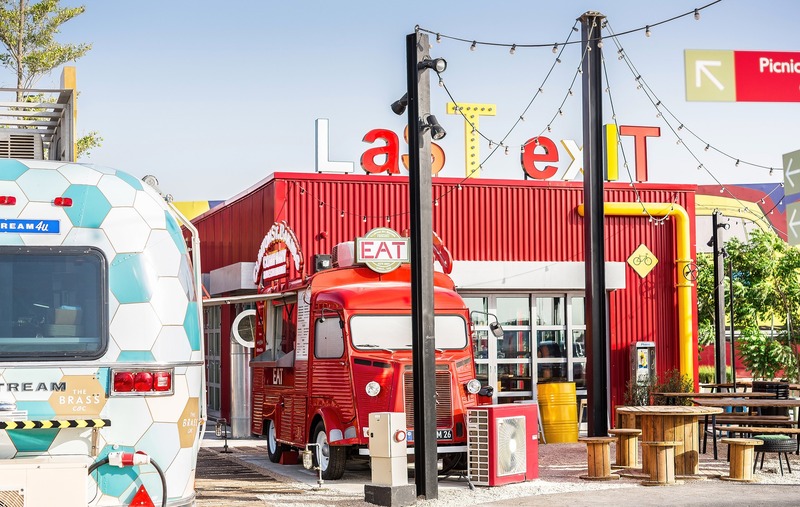 Location: You’ll want to look into the existing market research on your city to find whether it is a good idea to open up a food truck business there. Cities like Los Angeles and New York are already fairly saturated with food trucks, so if possible it might be a better strategy to choose a mid-sized city where there is not as much competition. If you do decide to brave the streets of the big cities, make sure that your menu offers something unique and exciting to attract customers. Parking: Most cities will have regulations that prevent parking in certain commercial districts or within a certain distance from brick-and-mortar establishments. Check the rules regarding parking near public parks and in residential districts in order to avoid tickets and run-ins with law enforcement. Choose a parking spot that works for your demographic. You might want to set up shop in a fixed location or, as is popular, let your Twitter followers know where you’ll be from day to day. It is also a good idea to talk to local business owners about setting up shop in their parking lots, which could help draw a decent lunch crowd and introduce your product to new customers. Offer something fresh and new: You should have an original or specialized menu idea that sets you apart and draws attention. This is especially important if you are in a city that already has a number of other mobile vendors. Trucks that use organic, locally-sourced ingredients are popular, as are trucks that cater to the multi-ethnic sensibilities of the millennial generation. This is the recipe for success for Kogi, the Los Angeles-based Korean barbeque taco truck. Kogi has almost 150,000 followers on Twitter and attracts customers willing to wait in line for 45 minutes before getting their food. You can also post a special online daily, weekly, or however often your menu choices change. Keep it fresh and you’ll keep them coming back for more. Change your location: Your customers, once they know how delicious your unique menu offerings are, will be excited to see what exotic new location you’ll be parking in each day. Utilize Facebook and Twitter to let them know where to find you. Perhaps you’ll bring them to a part of town they’ve never been to before, and perhaps they will discover something else that’s new and exciting while they’re trying out your new daily special. Make friends with other food trucks: If you can arrange to park together, you will find that you can draw quite a crowd. Play music, hand out blankets for picnics, put your laptop on a chair and play episodes of a popular show that your target audience likes every Wednesday. Be creative! If you are less like a food court and more like a travelling party, customers will be more than willing to line up and wait. Bring your product to events: Many food truck businesses see increased sales by catering office lunches, bar/bat mitzvahs and even weddings. Heck, you can even stage your own events. How about a scavenger hunt that leads your customers to the truck’s latest location? Food truck patrons have shown that they are willing to put in the extra effort if there is an exciting reward waiting for them. Sell more than just lunch: Have a special sauce that your customers just can’t get enough of? Try selling it online or at a local grocery store. Loyal patrons also might enjoy a t-shirt or a tote bag, especially if your truck sports a snazzy design. When it comes to the modern food truck, the sky really is the limit. With some delicious food and little creativity you are sure to draw a crowd and see your profits soar. For restaurant owners just starting out, the search for the right equipment and supplies can be daunting. Figuring out exactly what you need is a difficult task. For any restaurant, there will be a long list of equipment and supplies that need to be procured before even opening, and that list is different for each person and each restaurant. Limit yourself. When deciding how much equipment you need, the key is to limit your equipment. Evaluate your menu to determine the fewest pieces of equipment that are needed to produce all of the dishes. For example, if you own a sandwich shop, your absolutely essential equipment needs might be limited to a commercial refrigerators, refrigerated prep tables, ice machines and meat slicers. Add strategic extras. The list of essential equipment should be your basis for purchasing. However, if you have extra room in the kitchen and enough extra capital, you can purchase extra pieces: for example, a commercial food processor or cheesemelter. While this equipment may not be a necessity, it can reduce the kitchen labor required to produce your menu, enhance the final taste or appearance of the food or make your kitchen more flexible in case you need to change your menu in the future. Does slightly imperfect sound perfect to you? Shop Burkett’s Scratch and Dent Clearance section today! Most commercial kitchens need basic kitchen utensils on hand, such as scoops, spoons and spatulas. Often, fledgling restaurant owners overlook purchasing these necessities until the last minute, so before opening, be sure to consider even the smallest things you will need. Speed up your kitchen. Purchase handy food prep supplies, like vegetable cutters and slicers for high volume produce. Commercial kitchen tools like these can help increase your workers’ productivity. Stock up for storage. The last thing you want to do is overlook your storage requirements. Every restaurant will need food storage and shelving to hold its supplies. Many full-service restaurants will also require food service carts to help move supplies from one area of the kitchen to another. Do not overlook the tabletop. Every restaurant will need smallwares. Quick-service establishments will need disposable restaurant supplies, while full-service restaurants will need reusable dinnerware and drinkware. Most restaurants will also need other supplies for their tabletop, like condiment containers, tabletop signs and food baskets. Remember food safety supplies. Gloves, pot holders, hairnets and thermometers are easy to overlook, but they include essential items that any commercial kitchen needs to meet strict health codes and keep workers and customers safe. Every restaurant is different and therefore has different equipment requirements. Using a buying guide or speaking directly with an expert will empower you to make the best possible decisions when purchasing equipment. Think about going green. Purchasing eco-friendly restaurant equipment and supplies is a good way to help the environment and attract customers at the same time. It will also help you save a significant amount of money on your utility bills. Consider used or discounted equipment. On a tight budget? You may want to look into buying used equipment or equipment that is cosmetically damaged. Although there is some risk involved, for some restaurant operations, this is a viable option. 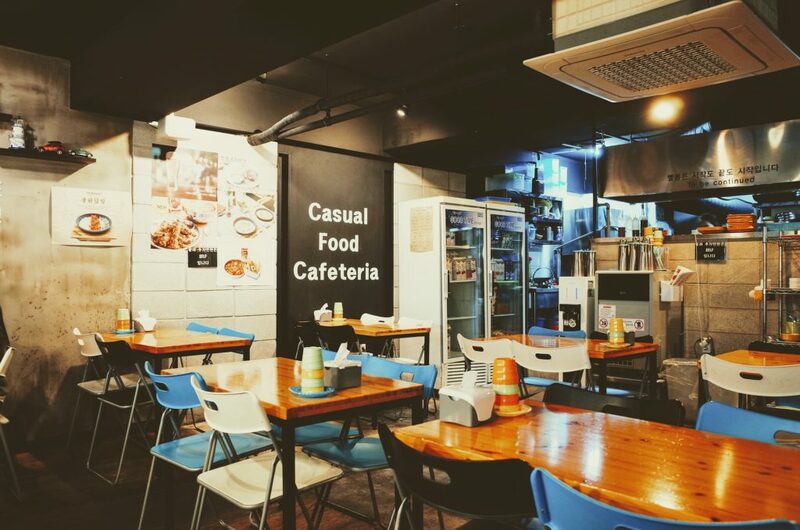 Check out this blog post on the pros and cons of used restaurant equipment. Price. While a local dealer may offer excellent pricing, usually the least expensive products can be found online. However, the cheapest online dealers usually offer low prices but lack the customer care services and expertise that can be found with higher-priced online or brick-and-mortar dealers. Expertise. Speak directly with salespeople to determine their level of expertise. If the salespeople seem to be experts at making a sales pitch, rather than having knowledge about the actual products they are selling, it may be time to find another dealer. Customer Service. When buying expensive equipment, any restaurant owner should make sure that their dealer offers superior customer service. Without good customer care, if you receive damaged equipment or your equipment does not live up to your expectations for any reason, you may be stuck with it. Installation. One of the major advantages of buying from a local restaurant equipment dealer is that they will often provide you with equipment installation, for a fee. If you buy your equipment online or at an auction, you are less likely to find installation included in the package. However, some online dealers, such as www.Burkett.com, will help you find someone to install the equipment. Finding the right equipment and supplies at a good price from a reasonable dealer is a major aspect of opening a restaurant. If you do not have the right supplies from the right dealer, it will end up hurting your bottom line in the long run. Be sure to carefully consider your equipment and supply needs, as well as your choice of dealer, before you begin to purchase. In a healthcare facility, ice is used for specific tasks including post-operative use, dietary needs and treatment to reduce swelling and inflammation. For each of these tasks, ice needs to be readily available within an easy to use and easy to maintain unit. Let’s take a look at the best ice machines for healthcare facilities. For busy doctor’s offices or hallways within hospitals and residential care facilities, nothing beats the convenience of dependable countertop ice machines and dispensers. With this type of commercial ice machine within reach, medical staff can retrieve ice quickly and within close proximity to treatment areas. Nugget ice is ideal for healthcare facilities as it is easy to chew, easy to mold and slow to melt, making it the best choice for dietary needs and ice packs. The dispenser mechanism speeds up the process for retrieving ice and minimizes the risk of cross-contamination. Ideally, healthcare facilities should look for countertop ice machine dispensers with touch-free controls. This type of control dispenses ice when a cup or other receptacle is sensed under the chute. Some dispensing ice machines are constructed with a built-in water dispenser as well. An Undercounter Ice Machine is a self-contained ice maker with an attached storage bin. This type of ice machine is designed to fit under countertop areas and provide quick access to ice without getting in the way of the fast-paced environment of an emergency room. Undercounter ice machines are also ideal for laboratories as they leave valuable countertop areas free for charts and documents. Undercounter ice machines are available for every style of ice. However, flake, nugget and cube ice are most often used in ER’s and laboratory settings. Flake ice is perfect for sculpting into therapeutic ice molds, cube ice is very slow to melt and nugget ice offers a chewable texture for patients. When shopping for an undercounter ice machine, be sure to measure the total space available, which includes height, depth and width. Also, consider how the bin door opens. Flake ice is perfect for filling or molding ice packs for therapeutic use. Shopping for a flake ice machine and a separate bin can be confusing and time-consuming. 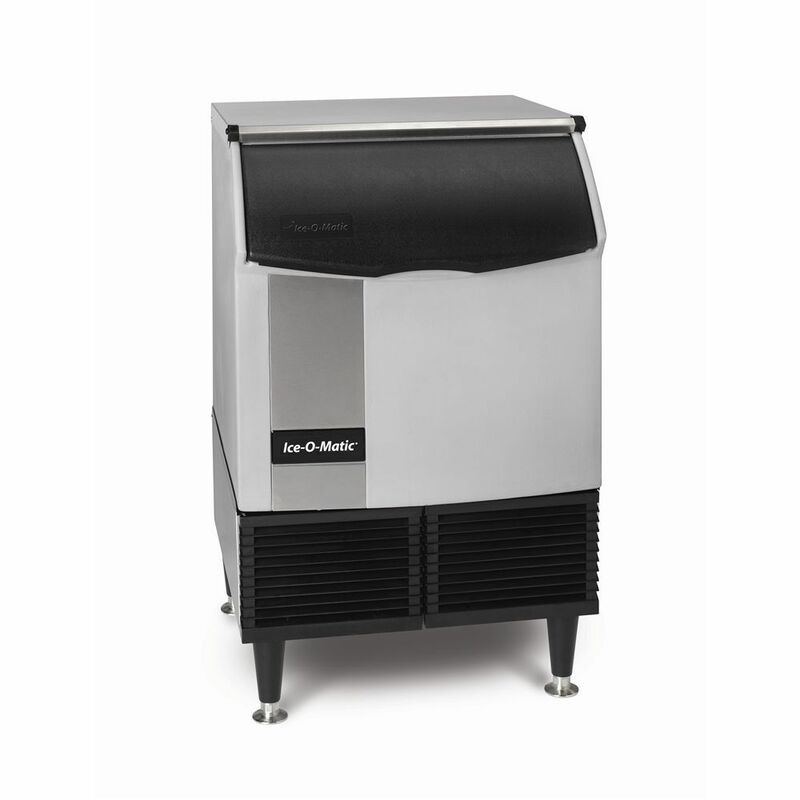 We suggest purchasing an ice machine and bin combination unit that is already matched up and ready to install. The full-size floor model combination units are perfect for physical therapy and sports medicine clinics as they provide a large volume of ice on a daily basis. When shopping for a combination flake ice machine and storage bin unit, be sure to note the daily yield of ice produced as well as the bin’s total storage capacity. Find the right ice machine for your healthcare facility and keep your patients happy and healthy. With the right specifications in place, you can have a quiet, efficient and dependable ice machine for years to come. As one of the leading distributors of restaurant equipment and supplies, Burkett’s catalog includes more than 100 of the top brands in food service. We are proud to introduce our latest brand offering, which is a Burkett exclusive. With SEAGATE Commercial Products, you’ll get quality commercial kitchen equipment that is affordably priced and ready to go, right out of the box. Choose from pizza prep tables, sandwich prep tables, reach-in commercial refrigerators and freezers, restaurant ranges, and commercial fryers. SEAGATE Commercial Products have been specifically designed for customers that are seeking quality workmanship at an affordable price point. All SEAGATE products come pre-assembled and are ready to go right out of the box. What does that mean exactly? That means when you get your brand new SEAGATE reach-in refrigerator and open the doors you won’t find any casters or other parts inside to assemble. From shelving to casters, everything comes already factory installed on the units. SEAGATE makes it simple. SEAGATE is redefining the standard for our industry and we couldn’t be more excited to offer it. That’s why you’ll enjoy free same-day shipping from our warehouse in Perrysburg, OH on all SEAGATE equipment. Your customers have come to rely on you for consistency and you’ve come to rely on your products for reliability and durability. With SEAGATE, you get a reliable and competitively priced piece of equipment that can handle the rigors of any commercial kitchen and help you deliver the consistency your customers crave When you can get value without compromising quality, it means a great deal. SEAGATE restaurant equipment is available exclusively from Burkett Restaurant Equipment & Supplies and is available for sale now by phone, online, or in our showroom store. Check out the full SEAGATE lineup at www.burkett.com/brand/SEAGATE. There are some very unique restaurants in Toledo, OH that are must-try for anyone who visits the city. Tony Packo’s is among those places thanks to some amazing history. 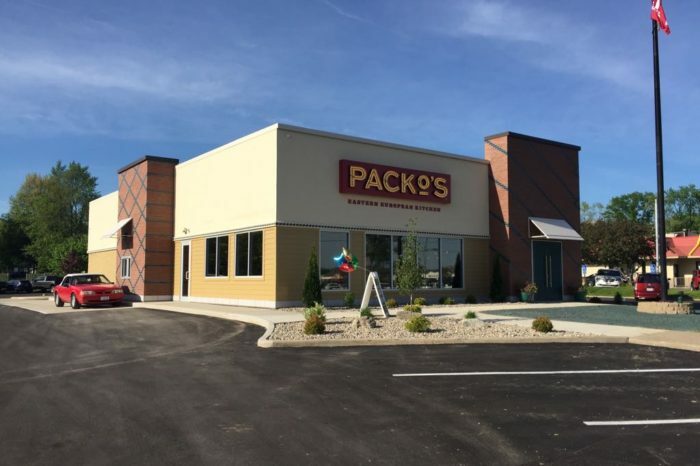 For the opening of its 5th location at 5822 Alexis Road in Sylvania, OH, Tony Packo’s chose to work with the Business Development team at Burkett Restaurant Equipment & Supplies for a complete build from design all the way through to installation. Burkett and Packo’s employees and other Packo’s friends and family members, got to see the fruits of their labor during a soft opening on May 23. Check out the pictures below and if you’re ever in the area, be sure to stop by after their grand opening on May 27. Congratulations, Tony Packo’s! Toledo has always been our home and it was an honor to work on a project for one of the city’s great icons!